What the Heck Is Total Cost Of Ownership of A Rubber Machinery? “What the heck is total cost of ownership of a rubber machinery?”. If this question has popped up in your heads after reading Prof. Dr.-Ing Andreas Limper’s interview, you are not alone. Neither is this concept new. Dr. Limper explains, in his interview, that the inability of a customer to see the ‘holistic perspective’ and evaluate machinery on ‘ownership cost’ basis is frustrating. This is because, most buyers select a rubber machinery on the ‘initial cost’. “So what?” you may ask me. And at this stage of our conversation, if I add that your ‘initial cost’ (basis which you made the strategic capital purchase) represents not more than 13-15% of your ownership cost! Well, do I have your attention now? This means in your TCO calculations, all your obvious and hidden costs of ownership across the full life cycle of the rubber machinery has to be considered. There is often room for judgement and sometimes different opinions, in deciding what is the appropriate lifespan for you to analyse. This is because some of your costs will be one-off, others will be recurring – so you need to know how many years you intend to use this machinery. For example, you could consider Depreciable Life (i.e the number of years in which the machinery is depreciated) or Economic Life (i.e the number of years in which the machinery returns more value to you than it costs to own, operate, and maintain) or Service Life (i.e. the number of years the machinery will actually be in service). In some cases there may be some residual value in the machinery or parts. However, you will also have costs associated with its disposal. Here’s a typical compilation of all costs associated with the purchase of your rubber machinery. Supplier identification costs like administration costs, telephone calls to discuss, travel, accommodation costs for factory visit and negotiations, etc. Cost of replacement service during a breakdown such as hiring (another) machinery or outsourcing the work. Decommissioning costs, involving technical specialists. Resale Value: You should remember to add back any money received on the resale of your rubber machinery and its accessories. TCO = Purchase Price + Regular Recurring Costs + Irregular One-off Costs + Disposal Costs – Income Generated – Revenue on Disposal/Resale Value. Do you get the ‘drift’ now? Do you agree with me that your decision to buy a rubber machinery only on the basis of initial purchase price could be a flawed strategy and need a rethink (…..if you are doing this, like the majority of other rubber machinery buyers!!). Having outlined these thoughts, let me also caution you that the success of your evaluation depends on the type of the machinery you buy. For example, you would not want to get into the same evaluation techniques when you buy a relatively simplistic (or one-off) machinery like bale cutter or sheet feeder as compared to a project investment of a mixing line or rubber mixing room. Summing up, the Total Cost of Ownership (TCO) is the total cost of your rubber machinery over the whole of its life and, I think, should be the most important criterion when you invest in projects and/or strategic capital purchases. Contact me if you seek more details on this topic. Or if you are looking for New or Used Rubber Machinery? Categories: Allied Machinery, Calendering Machinery, Compounding Machinery, Curing Machinery, Cutting Machinery, Extrusion Machinery, Lab Equipment, Mixing Machinery, Moulding Machinery, Non-Tire Rubber Industry, Retreading Machinery, Rubber Reclaim Machinery, Tire Industry, Vulcanizing Machinery | Tags: Depreciable Life, Disposal Costs, Economic Life, operating costs, Purchasing Costs, Rubber Machinery, Service Life, TCO, Total Cost Of Ownership | Permalink. Tire Buffing Machine is a widely used tire retreading equipment. The other known names include Tire Buffering Machine, Tire Buffer, Tire Buffing Apparatus, or Raspers. When you get a tire that passes all the initial checks and is certified as a worthy candidate for retreading, your first job is to buff this tire. Buffing is the process by which you remove all the old-worn tread on the tire, and prepare the tire casing for the application of a new tread. Buffing also trues up (the roundness) your tire casing. A buffed tire gives you a textured surface on the tire casing and this aids in proper adhesion with the new retread that you will later apply on this surface. Typically, a tire buffing machine has a rasp pedestal and a connected mobile assembly to swing the rasp pedestal perpendicularly. Each rasp pedestal has a rasp head and a texturing device. The rasp pedestal rotates about a vertical axis. A tire hub assembly on this machine rotates the tire casing. The tire buffer is controlled by an operator station through an operator console unit. You get tire buffing machinery to buff all the available tires – large or small size, radial or bias, two-wheeler or OTR. The speed of spindle varies according to different tire size. Usually lower speed is apt for bigger tires, and higher speed suitable for smaller tires. These are all free-standing machinery and equipped with a dust collection system for pollution control. Safety mechanisms to increase life of the grinder, automation of operations through computer-controlled programming, ancillary equipment like tire loaders, automatic lifting and centering of your tire, measuring device to ascertain steel wires (and thus prevent its damage), efficiency and precision of buffing, automatic blade-wear compensation, automatic reverse rotation of buffing head, blade cooling, sound-proof enclosure and overall user-friendliness will differ from manufacturer to manufacturer depending on the machine you select. However, the operations are mostly similar and easy to visualize. First you mount the tire onto the expandable hub on the tire buffing machine. Then you inflate the this tire to its normal running shape. This action ensures that your tire is buffed to the correct profile and radius. When you delve deeper into this subject, you will notice that every tire buffing has its specific settings to be considered on the machine (either manually or automatically programmed). Few of these settings include Expandable Rim Number, Tread Size, Radius, Trim Angle, Cut Depth, Shoulder measurements (left, crown and right), and finished buffed circumference. Attention to these parameters ensure that your final retreaded tire provides its peak performance always. Before you start buffing, care has to be taken that impregnated stones or foreign materials that could cause potential damage to the tire buffing machine needs to be removed by the operator. And always start buffing at the highest part of the crown of the tire. This prevents overloading of the buffer. Operate your tire buffer until all of the tread design is removed.Then you buff the shoulder and side walls as is appropriate to your retreading process. If you leave much of under-tread on the rim, you will find it very difficult to skive the casing (for repair). Also excessive under-tread can cause high heat generation when the tire is put in use. This can lead to retread failure. On the other hand, if you do not have enough under-tread, this can affect the bond between the casing and the new retread you will apply on the textured surface. Summarizing, tire buffing is part of the tire retreading operation and tire buffing machine removes the tread of your worn tires. I look forth to your comments. Categories: Cutting Machinery, Retreading Machinery, Tire Industry | Tags: Raspers, Tire Buffer, Tire Buffering Machine, Tire Buffing Apparatus, Tire Buffing Machine, tire retreading equipment | Permalink. A Bale Cutter is a common rubber machinery, also known with its monstrous synonym – Guillotine. Rubber needs to be cut into small pieces before they are fed into the batch mixer. The rubber bale cutter (aka guillotine) does this job to the satisfaction of most users. In the past, there has been guillotine machines with a fixed knife and a table moving upwards. In its current form, hydraulic bale cutters are popular. The standard bale cutter is designed for 33.3 kg bales. They handle all Natural Rubber (NR) and Synthetic Rubber (SR) bales in the range 25-35 kg. This is because, NR usually comes in rectangular shape with a weight 33.3 kg or 35 kg (± 5%) and dimensions 670 mm x 330 mm x 170 mm. Bulk SR such as unvulcanized elastomer is normally supplied in a dense rubber bale or slab wrapped in a thin protective plastic film. Its size is around 600 mm x 450 mm × 200 mm and weighs 24 kg. While a bale of this size can be fed directly into batch mixers, the bale cutter is required to get the correct weight for the compound recipe being mixed in a batch. Hence, most standard bale cutters has a cutting section varying between 600-750 mm and a cutting height of 300 mm. Each machine consist of a cutter or a precision blade, hydraulic cylinder, frame structure and hydraulic power pack unit. The hydraulic oil supplied by the hydraulic power pack unit operates the blade or cutter through hydraulic cylinder to cut the rubber bale.Most manufacturers incorporate roller conveyor or conveyor belts in their bale cutters for carrying the rubber bale to the blade and similarly discharge conveyors to transport the cut slices further away from the blade. Advanced rubber bale cutters does not require operator attention other than during loading. They have a continuous blade cycle with conveyor advancing in a pre-determined speed. Such machines have an in-built cutting control and display unit operated by PLC controlling various guillotine functions. This includes pre-programming the required cutting information such as nominal slice thickness, total number of cuts required or dwell time between cuts. In some bale cutters, a pneumatically actuated plate keeps steady the bale during the cut operation. Bale cutters can be dangerous for an operator if not securely fenced with interlocking access gates and interlocking guards to prevent access to the cutting area. So it is crucial that rubber bale cutters are comprehensively guarded for safe operations. With user-friendly features, safety and automation incorporated, manufacturers compete to position their bale cutter as high technology rubber machinery for better quality cutting and higher productivity. Categories: Allied Machinery, Cutting Machinery, Non-Tire Rubber Industry, Tire Industry | Tags: Bale Cutter, batch mixer, Guillotine, hydraulic bale cutters, Natural Rubber (NR), rubber bale cutters, Rubber Machinery, Synthetic Rubber (SR) | Permalink. Internal Mixers and Mixing Mills are familiar rubber compounding machineries for short production runs. This is because of their broad range of shear capabilities and acceptance of all feed forms. Yet, rubber goods producers and tire manufacturers are familiar with their demerits viz. varying power demand, batch-to-batch quality variation and labor intensive operations. Can you improve the experience and performance expectation? Yes, through the introduction of Sheet Feeders with Rotary Cutter. Sheet feeders are designed for quick installation onto your existing layout. It could be either mounted to your Mixing Mill frame or put up in front of the weighing conveyor in a Mixer feed line. This means that space constraint never becomes an issue for you to extract more out of your existing mixing operations. And since only one operator can control the mill (or mixer) and sheet feeder, the operation does not increase your labor cost. Sheet feeder’s with hugger belts replaces the conventional manual loading of rubber sheet on to the mill. This machine enhances your worker’s safety, and makes the loading operation safe. And because it facilitates continuous positive feed of the rubber sheets into the mill (or mixer), the operation feels ‘automatic’. The rotary cutter on the sheet feeder cuts the fed rubber sheets into uniform rectangular pieces. This results in better dispersion of the rubber sheets in the mixing mill (or mixer for final batch). The internal mixer rotors performs reactive, dispersive and distributive mixing of uniformly cut rubber sheets faster and better than a long sheet fed into the mixing chamber. The result you experience is a homogenized rubber mix, independent of the operator efficiency or any weight variations in the batch. The quicker mixing of the cut pieces shortens the mix cycle; thereby increasing the productivity of your internal mixer or mixing mill. Summarizing, Sheet Feeders, is a simple machine which when installed to feed the mixing mill line or batch mixers, increases efficiency, reduces manual intervention and improves consistency of mix. This is also known as Mill Feeder, Rubber Feeder or Stock Loader with disc cutter. Prodicon, Bainite Machines and few Chinese manufacturers offer them in the world market with customized specifications. Pelmar offers used-machinery of this category. Please do let us know of your observations and notes on this allied machinery increasing efficiency into your existing rubber mixing line. Categories: Allied Machinery, Compounding Machinery, Cutting Machinery, Mixing Machinery | Tags: allied machinery, automatic, Bainite Machines, batch mixer, consistency, continuous feed, disc cutter, efficiency, Internal Mixer, mixer rotors, mixing line, mixing mills, Pelmar, Prodicon, rubber compounding, rubber feeder, sheet feeder, sheet feeder with rotary cutter, stock loader | Permalink. The new government of Narendra Modi has enhanced India’s image in the world economy. And a new thrust is being built-up in our manufacturing arena. The flavor of the season has been the rising roar of lion (read “Make in India” logo). Their Facebook page has garnered 2.1 million ‘Likes’ while “#EASEOFDOINGBUSINESS” is popular hash tag on Twitter, reflecting the aspirations of a billion dreams. We have a stable and strong pro-industry government. Global economy is picking up, and India’s core advantages continue to be strong. The government has started well, and already made few minor yet important changes to improve manufacturing sector. Their intent to address obstacles across infrastructure, labour reforms and ease of doing business along with marketing of Brand India are much awaited heartening measures. Rubber machinery comprises of equipment used for Compounding, Mixing, Shaping, and Vulcanizing. This industry in India manufactures mixers, mixing mills, calenders, extruders, tyre curing presses, tyre moulds, tyre building machines, bias cutters, injection moulding machine, etc. Estimated at USD 405 million (in 2014), the total market in India is expected to grow at 20% CAGR to USD 580 million by 2016. According to the Ministry of Heavy Industries (MHI), currently there are 19 units in the organized sector for the manufacture of rubber machinery required for tyre/tube industry. The Indian rubber machinery manufacturing industry is a net exporter. Up to 100% FDI is allowed under the automatic route. Technology collaboration is also freely allowed. The Indian Rubber Machinery industry is mostly a cluster of SME’s that epitomises the famous “jugaad” entrepreneurial spirit. Over the years, some have grown and compete globally. I wear the name of one such home-grown brand on my chest – Bainite Machines. Today, some leading global brands in rubber machinery have manufacturing presence in the country through JV’s, wholly owned subsidiaries or technology license arrangements. Industry has witnessed growth in tandem with our growing economy in the past. Domestic manufacturers have 60% share in the machinery market. Share of imports is 40%, mainly from Far East on account of low price and shorter delivery. An accepted approach to purchase equipment today follows this thought process – customers need to look West (Europe) for advanced technological machinery if the price tag is affordable or look to China for a low-cost replica. Another option is to import used-machinery, which is being discarded by the developed world, at an attractive price tag. Should this approach be refined? Yes, let me explain. Increased deployment of used-machinery will render our domestic rubber processing industry inefficient in the long run. Because, rubber processors in the developed world are replacing the older machines with new technology machines under the compulsions to reduce the carbon footprint. Old/Used machinery has high operating cost, higher energy consumption as well as loss of productivity from higher maintenance. One industry friend said this aptly “its wishful thinking to assume another enterprises’ liability (used-machinery) can be your long-term asset (productive machinery)”. Is it then China? Wait! Recent statistics are interesting. They reveal China is slowly loses its manufacturing edge. And the reasons are multiple. The labour there aspires to work in hi-tech factories creating workforce shortage for labour intensive machine shops. Wages are rising over 10% per year higher than Indian labour cost increase. The rising Yuan (over 7% against dollar in last three years) makes China’s exports costlier while dropping Rupee (over 26% against dollar in last three years) makes India’s imports costlier. Reports of various forex experts suggest China can afford to let the Yuan strengthen a little bit more while Rupee will remain currency competitive as along as India’s trade-deficit is under control. Also for world-wide importers, shipping costs out of Chennai or Mumbai to most ports of the world are competitive (sometimes even lower) to that from Chinese peers. Most tire producers around the world and few rubber product manufacturers standardize their production processes across their multiple plants. They adopt one machinery manufacturer for one particular production step and develop them to their customization requirements. This is a win-win situation for both the machinery manufacturer and end user. It’s an acknowledged fact that Indian machinery manufacturers meet 95% of domestic rubber processing industry needs on technology and product range. Our product technologies are at par with leading brands of developed world albeit offered at great cost advantage. This is also because leading manufacturers know their fundamentals well. We understand machinery and also rubber processing. The importance of metallurgy, selection of the right material technology, process technology and appropriate designs that bring out machine systems which are long lasting is paramount to us. And hence, we can design and manufacture customized equipment for our customers. This is definitely our niche as compared to competitors of Far-East. So, I feel, Indian rubber machinery industry is well positioned on the technological and logistical fronts to offer customized USPs in both domestic and export markets. Indian machinery manufacturers have undertaken capacity expansion, upgradation in technology and adoption of best manufacturing practices to compete effectively – both in the domestic and export markets. At Bainite Machines, we had started a phase-wise replacement of conventional machines with CNC’s since 2011. We invested in latest design and simulation software to build newer machineries like TSS from scratch, introduce latest B-Turbo tangential rotors, and offer value added sophistication to our regular machineries. The focus is shifting to automation to create customer value. Smart automation on rubber machineries improves productivity of our customers and enhances operator safety. For example, we developed fully automatic Mixing Room technology requiring only one operator and have highest levels of safety interlocks in the complete processing line. For a large rubber processor, adopting technology and automation is sustainable because the benefits include lower cost of production (cost/kg), consistence in quality, superior aesthetics and reduce defects in throughput production. Operator-friendly, energy-efficient, machinery that are safe, meets global compliance standards and satisfies the technology appetite is the need of the hour. Bainite Machines recognizes this and design customized machinery. Our recently built Hydraulic Ram in Mixers has a Ram up and down time of less than 3 seconds which in conventional mixers used to be 7 – 8 seconds. In a mixing cycle, there are 2–3 Ram Up and Down operations and hence this 4 seconds saving in each stroke is a tremendous boost to productivity. Our tagline “Technology That Drives Industry” encapsulates Bainite’s dreams to be a technology driver and is equally fuelled by a passion to position an Indian Machinery manufacturer as a significant force to reckon within the global rubber/tire machinery market. Similar aspirations prevail among my industry friends. What Next – Two Way Bridge? Indian Rubber Machinery Industry requires further investments to raise the production volumes and technology to global scale. Volumes will give price competitiveness that our customers expect from us. 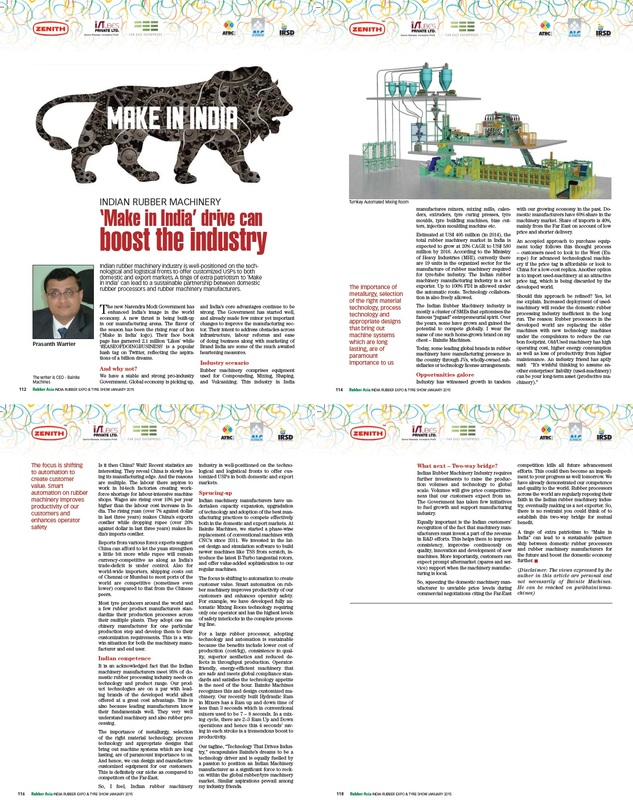 Government has taken few initiatives to fuel growth and support manufacturing industry. Equally important is the Indian customers’ recognition of the fact that machinery manufacturers must invest a part of the revenue to R&D efforts. This helps them to improve consistency, improvise continuously on quality, innovation and development of new machines. More importantly, customers can expect prompt after-market (spares and service) support when the machinery manufacturing is local. So, squeezing the domestic machinery manufacturer to unviable price levels during commercial negotiations citing Far-East competition kills all future advancement efforts. This could then become an impediment to your progress as well tomorrow. Indian Rubber Machinery Industry needs your patronage today more than ever. We have already demonstrated our competence and quality to the world. Rubber processors across the world are regularly reposing their faith on the Indian Rubber Machinery Industry, eventually making us a net exporter. So, there is no restraint that you could think of to establish this two-way bridge for mutual benefit. A tinge of extra patriotism to “Make in India” can lead to a sustainable partnership between domestic Rubber Processors and Indian Rubber Machinery Manufacturers for the future and boost the domestic economy further. Categories: Allied Machinery, Calendering Machinery, Compounding Machinery, Curing Machinery, Cutting Machinery, Extrusion Machinery, Lab Equipment, Mixing Machinery, Moulding Machinery, Non-Tire Rubber Industry, Tire Industry, Vulcanizing Machinery | Tags: bias cutters, Brand India, calenders, Compounding, extruders, FDI, injection moulding machine, jugaad, Make In India, material technology, metallurgy, Ministry of Heavy Industries, mixers, Mixing, mixing mills, Narendra Modi, patriotism, process technology, Rubber Asia, Rubber Machinery, Rubber Processors, Shaping, Smart automation, Technology That Drives Industry, tyre building machines, tyre curing presses, tyre moulds, Vulcanizing | Permalink.